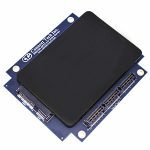 The SATA34106 2.5″ SATA Drive Controller Peripheral Module is available with a Flash or Rotating drive. A hot-plugging removable drive in rugged IDAN configuration is available. TSSD-01, the solid state storage module, which designed using the NAND technology. Through that a card is projected as a strong robust, is immune to corruption caused by vibration, shock and extreme temperatures. PC/104 Consortium Member: Sealevel SystemsInc.